WAILEA, Maui, Hawaii — Aaahhhhhhhhh. That’s the prevailing thought in my head as I step to the first tee at the incredible, inspirational Wailea Golf Club’s Emerald Course, here in the 100 percent pure, Grade-A, unfiltered paradise called Maui. 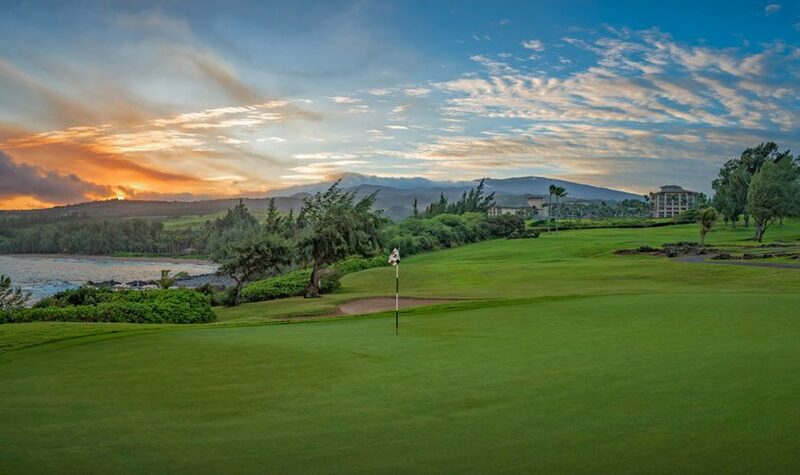 On a Hawaiian island known for its impossible, heartbreaking beauty, from its powdery sand beaches, to its crashing cliffs, towering peaks and spectacular sunsets, it might seem easy to overlook its stellar golf scene. But here on the Robert Trent Jones Jr. designed, glorious green gem of a course called The Emerald, it’s impossible to over – look how special it is — especially considering what the course overlooks: a stage set for the ultimate golfer’s getaway. It’s a bright January day, and while the Midwestern wind chills have dipped into the single-digits back home, here the gentle ocean breeze is just cool enough to keep you from sweating through your polo and shorts. The sun is just coming up on the other side of the island, diffused into a warm glow by the towering Mount Haleakala, a 10,000-foottall dormant volcano in the middle of Maui’s heart, but it’s already 72 degrees, and quickly climbing toward perfection. It’s a terrific time of day on the island, one usually set aside for the surfers, but things are already hopping here at Wailea Golf Club. The first tee times are getting ready to go off, and the team of attendants is busy choreographing a stacked tee sheet. 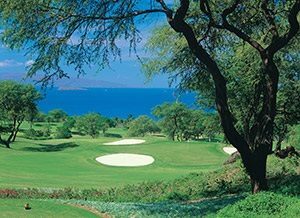 Wailea Golf Club is one of several stellar golf resorts on Maui, offering three championship courses — The Emerald, The Gold and The Blue — and champion views, too. 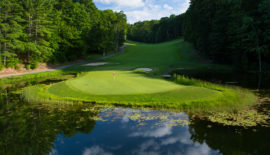 The Emerald Course was built by Jones Jr. in 1994 and is the most popular of the bunch, named to several “Best Course For Women,” lists, among other accolades, for its player friendly layout. The Emerald’s fantastic, par-4 fourth hole features views and lava rocks. Photo by Ray Mains. 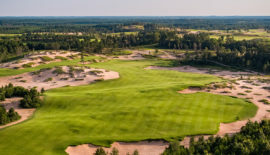 The much tougher Gold Course was also designed by Jones Jr., and also opened in 1994 to rave reviews, named by both Golf Magazine and Golf Digest as one of the country’s 10 best new resort courses. Conde Nast Traveler readers named it one of the world’s best-designed courses, as well. 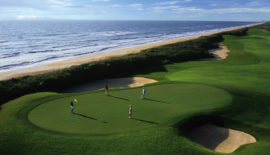 The longest of the three courses at 7,078 yards, the Gold Course played host to The Champions Skins Game from 2001 to 2007. With dramatic elevation changes, natural lava rock outcroppings throughout and a strategic layout, the Gold is a true test for every level of player. The older, gentler Blue Course started it all in 1972, winding its way through the hillside of nearby Kihei, on the downward slope of the mountainside. The Blue is often the favorite of returning players to Wailea, but it’s hard to go wrong on any of the trifecta; all three courses offer ocean views from every hole. Some of the best views are found at the beginning. Wailea Golf Club’s clubhouse starts out with what has to be one of the best views in golf, staring out into the Pacific Ocean below, filling your field of view with the deep blue sea and the Molokini Crater, which peeks its head above water like one of the many whales Maui is so well known for. Far out in the mist and haze beyond Molokini, you can see seven miles to the Kaho’olawe Island Reserve, the smallest of Hawaii’s eight volcanic islands. 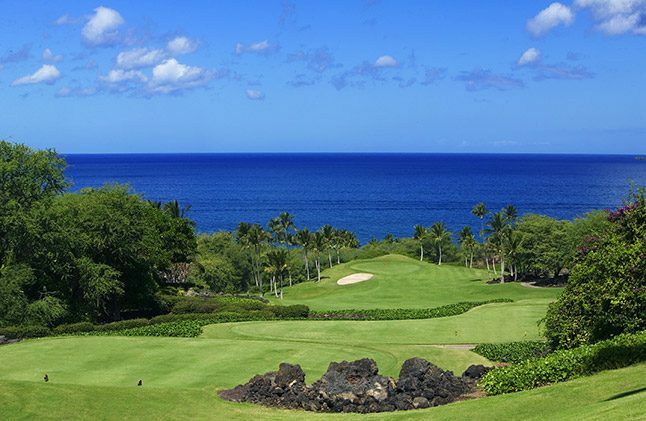 Wailea is one of the highest-rent districts in all of Maui, and Wailea Golf Club is no exception, with exceptional amenities including fine dining, tennis and golf academy, all in a lush, lavish setting fit for a tropical botanical garden. The grounds are full of tropical flowers, plants and pools, making it easy to forget your reason for being there: the great golf. 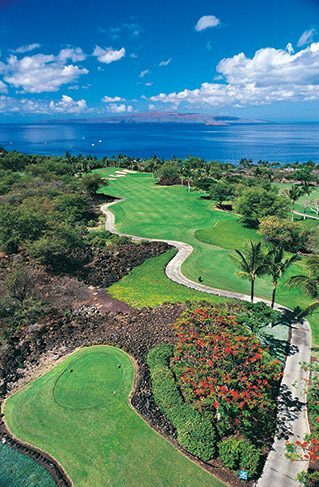 All three of Wailea Golf Club’s courses have ocean views from every hole, like sights from the Emerald’s 13th hole. Today we tackle the Emerald, the crown jewel in this corner of the island. At 6,825 yards from the tips, the Emerald is a resort course designed to give you just enough test — without intentionally ruining your Hawaiian vacation. The Emerald’s fantastic first hole, a downhill, 380-yard par 4, offers plenty of ways to get your heart racing. Like most of the course, the opener offers wide, forgiving fairways and is framed by lush, tropical flora, just begging you to grip it and rip it. It’s a great way to ease into your round, getting you ready to try and reach the 532-yard par-5 second hole in two, where you’ll be no doubt distracted by the view of the ocean over on your port side (that’s the left, for all you landlubbers). Highlights on the rest of the front nine (beyond the views), are the 346-yard, par-4 fourth hole, where you’ll encounter lava rocks in play for the first time, and No. 6, a huge downhill dogleg par 4 measuring 456 yards from the tips. The back nine begins with a bang, starting with the 392-yard, par-4 10th hole, the ying to the yang of the 332-yard, par-4 17th hole. Both wrap themselves around the Emerald’s largest lake, a 2.7-million-gallon brackish pond, before a “meeting of the minds” at their double green, the first in all of Hawaii. 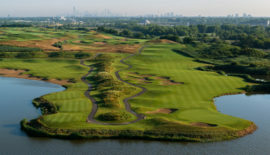 Other highlights on the back are the enormous, 578-yard, par-5 11th hole, which is the longest on the course and plays down to a peninsula green, and the 188-yard 16th, the prettiest of the Emerald’s excellent par 3s, and the start of a stellar finishing stretch. After you walk off the double green at 17, you head to the 18th tee box, one of the highest points on the property. The views again are as expansive as they are impressive, and you’ll savor every inch of the last 558 yards of the Emerald, on the stunning, par-5 finisher, playing downhill to a green surrounded by bunkers. The Emerald’s 18th is a fantastic way to end your round, offering plenty of what brought you here in the first place. It’s mid-morning now, the sun peeking over the top of Haleakala behind you, burning the haze off the surf ahead. The Emerald bids you fond farewell, but the day is just beginning, and the memories are forever. Like the island itself, Wailea Golf Club’s magic is everywhere you look here — and impossible to overlook. Visit www.waileagolf.com or www.gohawaii.com for more information.